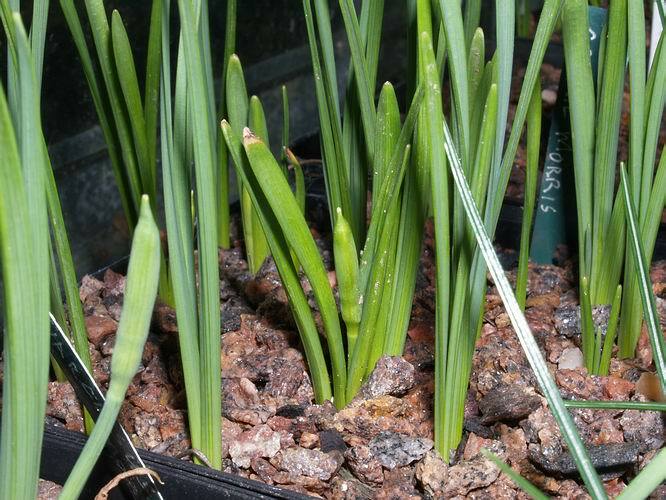 With the cold damp conditions we are experiencing, not much has moved on since last week's bulb log as new flowers are developing very slowly. 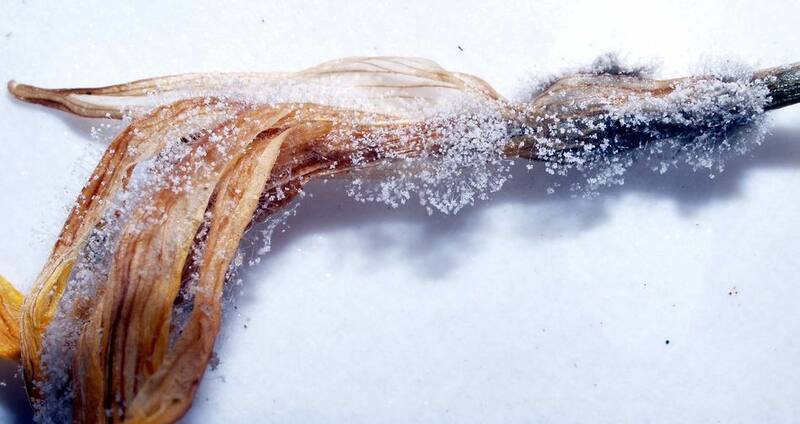 However while these conditions are not the best to open flowers they are ideal for the growth and spread of Botrytis. 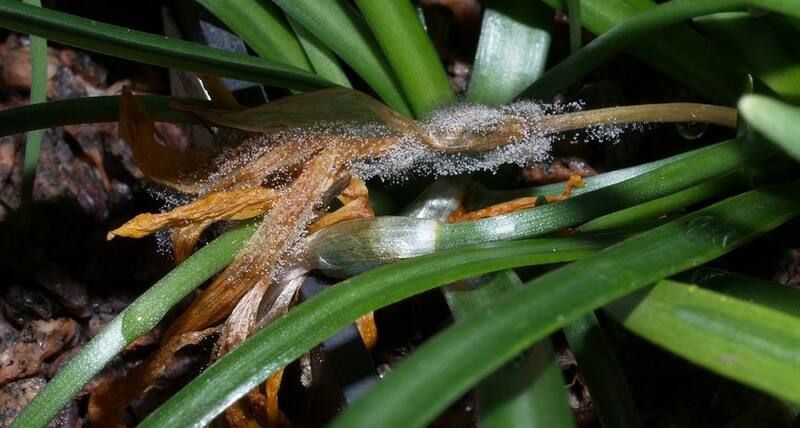 This grey mould is quick to form on dead flower petals whenever they are laden with moisture and the big danger if you do not remove these dead flowers is that the botrytis can spread into the healthy tissue of any plants that it comes into contact with . All of nature is fascinating and worth careful study so before you discard the dead flowers that are infected with Botrytis take a minute to look at the structure of the fruiting bodies - like little bits of snowflakes suspended on the end of very thin glass threads. 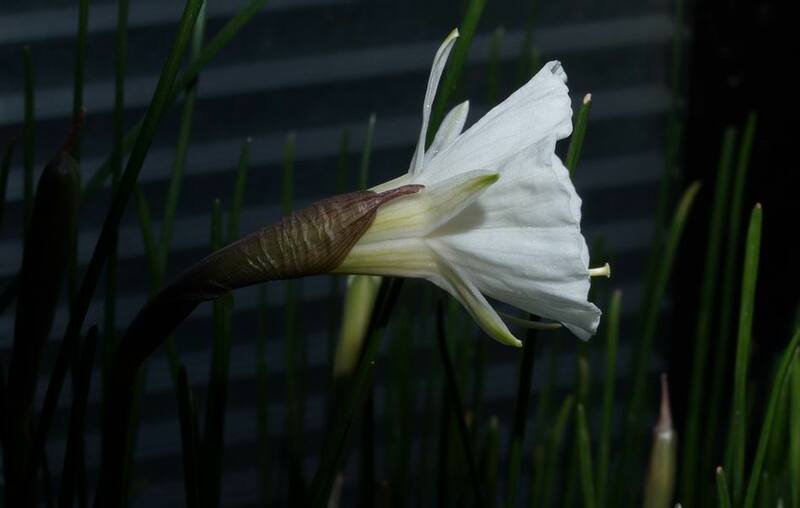 As requested and promised, here is yet another picture of my pot of Narcissus 'Joan Stead'. I mentioned last week that I was not sure if I had a single variable clone that exhibits different degrees of the lobbing of the corona or if in fact that I received more than one clone of this Don Stead hybrid. I have to say that my favourite is the one at the top of the picture where the notching of the lob extends about half way down the corona and that is the one I want to name 'Joan Stead' - if it is an unstable clone where the degree of notching is variable then that is not so desirable. Other features shared by all the flowers in this pot are that the style and stamens protrude well beyond the end of the corona and also the petals are longer than the corona. Just opening now is Narcissus romieuxii mesatlanticus which is always one of the first of the N. romieuxii forms that I grow to open its flowers. I have mentioned before that I have a strong suspicion that this fine plant may have some hybrid blood in it with N. cantabricus foliosus being the other species I suspect of being involved. The first flower of Narcissus x 'Camoro' is now open and checking back I find that these flowers are a bit later to open than they have been for a number of years. 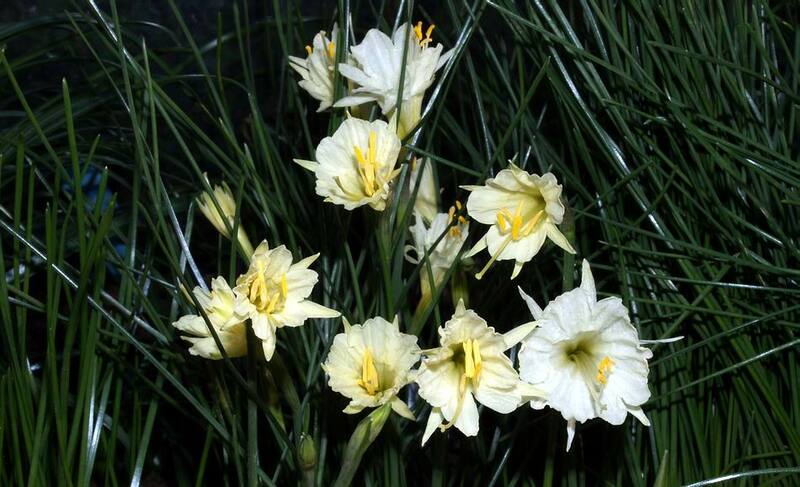 This fine plant is a hybrid between Narcissus cantabricus monophylus and N. romieuxii made by Henry Taylor. It is a fully fertile hybrid that produces viable seeds and I have raised a number of fine flowering bulbs from 'Camoro' that while closely resembling the parent do vary slightly, mostly in the size and flaring of the corona. Lagging well behind is Narcissus 'Cedric Morris' which in the last number of years has had its flowers open by this time. I do remember being confused when my friends in the far south used to have this bulb in flower before Christmas while my plants did not flower until February - then one year my plants flowered in the last quarter of December. 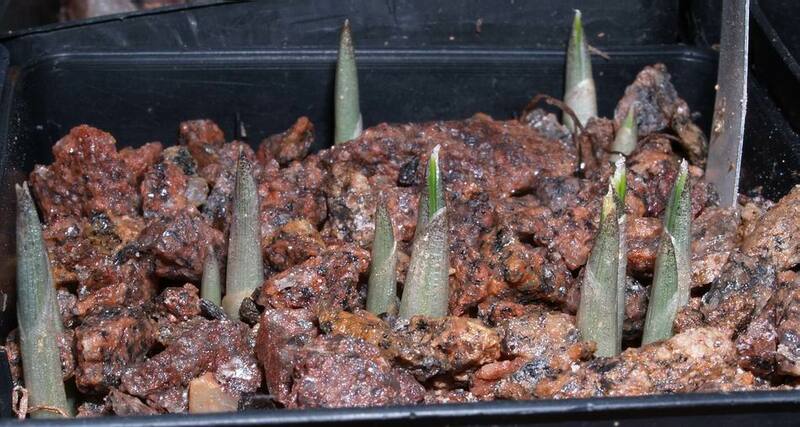 The difference is the temperature after the bulbs have started into growth and are forming roots. If it is cold they will not flower until the new year comes but if the temperature remains mild then they flower before the onset of winter. 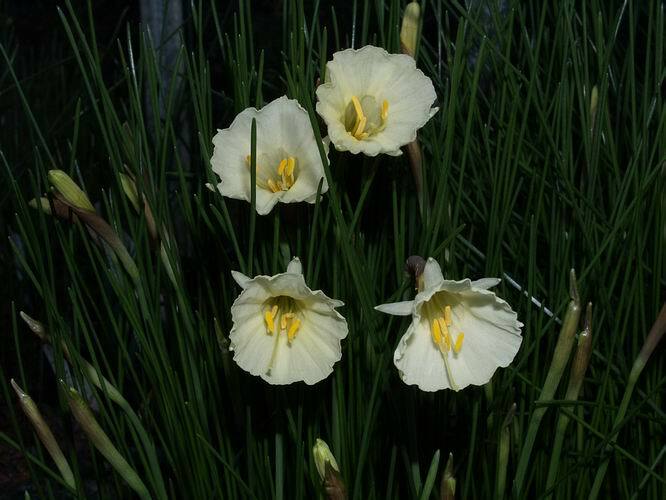 I have not worked out the critical temperature but it is the same for all these winter flowering Narcissus as I remember showing a pot of N. 'Camoro' in peak condition at a Stirling Show towards the end of March at the other extreme I have had the first flower open before the end of October . Here are a very nice group of pots of Ornithogalum species showing their lovely leaves - I got these in the late summer from Tony Willis who was having a bit of a clear out and offered them through the Forum pages. I have always been interested in Ornithogalums but have never grown many so I jumped at this opportunity to acquire a few flowering sized bulbs and having seen some of the beautiful species posted recently on the Forum pages I am glad I did. With the winter closing in it is nice to see the shoots of promise for the flowers of the spring like these Crocus korolkowii 'Lucky Number' shoots. This is one of Janis Ruksans' many fine forms of this lovely crocus species and I am delighted to see Janis, now he has a good internet connection, sharing his wonderful plants, pictures and experience with us on the SRGC Forum which just goes from strength to strength. If you have not logged into the forum pages before you should go right now and check it out it: very active with plantspeople and enthusiasts from around the world posting pictures of plants in gardens and in the wild habitat - the Crocus pages are of special interest to me just now and the Galanthus are looming. I thought I would just show the progress of a few of the troughs I made now they are planted up. Both of these troughs have got Androsace species in and considering they had their roots completely washed free of any compost and were planted just two months ago I think they are looking good. They did go a bit limp at first but picked up after about two weeks suggesting to me that they have now got their roots growing into the sandy compost. These two- one planted with Saxifarges and the other with New Zealand plants- had exactly the same treatment and are also looking promising - I will keep you updated on their progress in the spring. 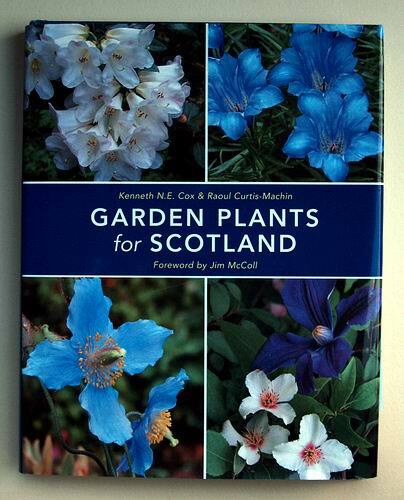 One more book I want to review this year is 'Garden Plants for Scotland' by Kenneth Cox and Raoul Curtis-Machin and published by Frances Lincoln Limited. 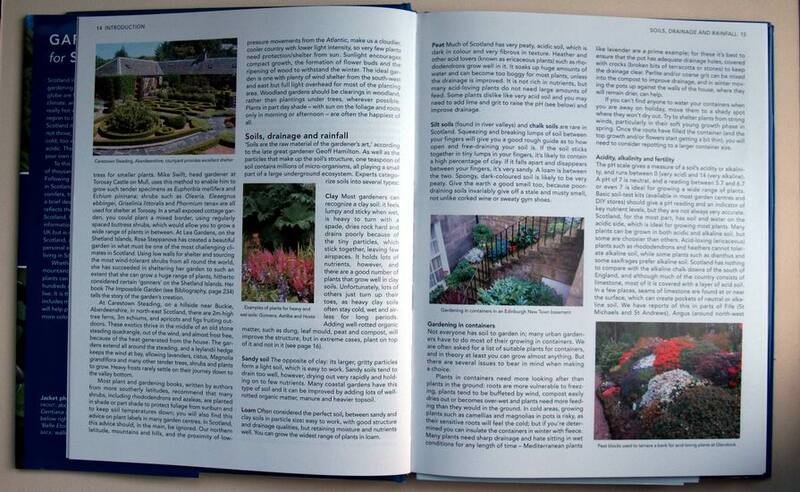 This is an excellent idea for a book that for once suggests the plants most suited to growing in Scottish gardens. 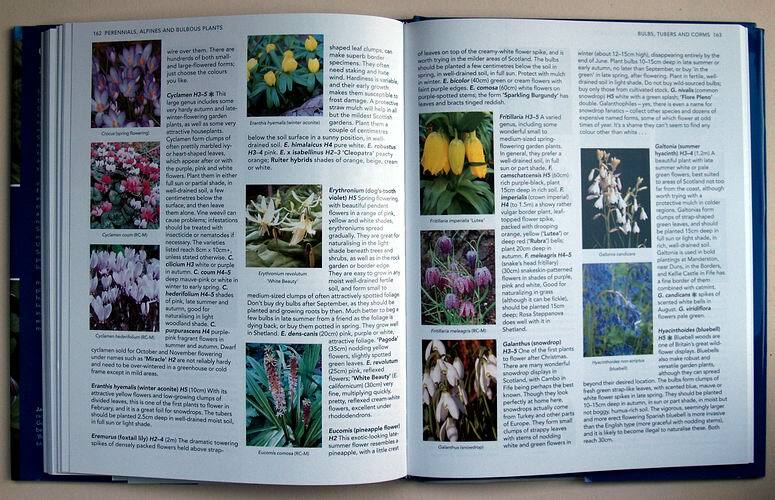 So often this type of book is written by someone living much further south where some plants thrive in the warmer drier conditions, while some that perform superbly in Scotland never get a mention or are described as difficult. While it is aimed at Scottish gardeners it could equally apply to anyone with a similar cool moist climate. 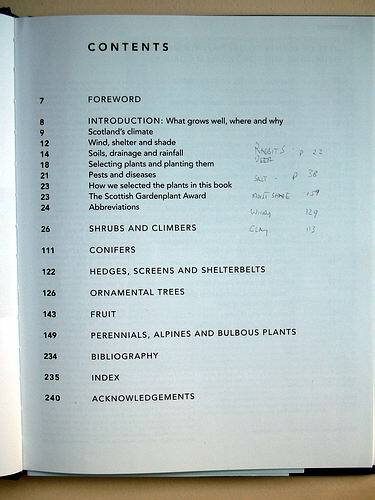 The contents page shows that the Authors have split the book into sections giving the different types of plants, hedges, fruit, perennials etc, their own chapters - for me this is a big help to any gardener when looking for specific plants as you can quickly find the best and recommended range to suit your needs. The introduction is very well written and for once an author has tried, and I think succeeded, to explain how the soils, drainage and rainfall are all tied together and also how they affect the 'hardiness' of a plant which is not just about lowest temperature. 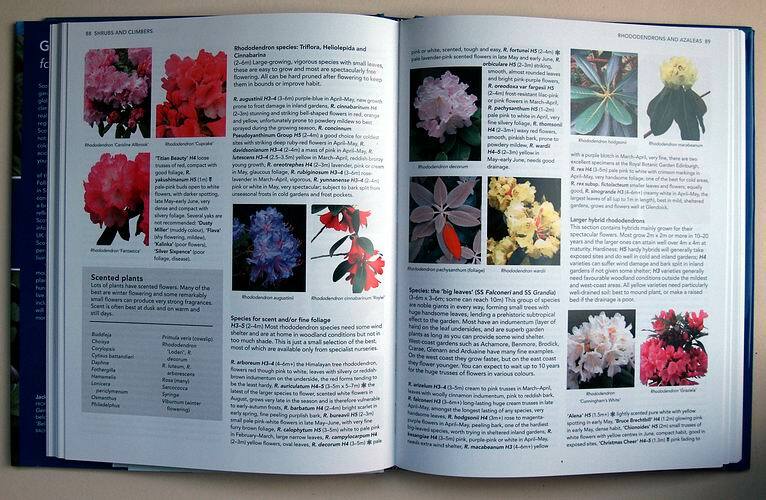 Obviously Rhododendrons are well featured in the shrubs and climbers section. All the plants in all the sections were rated or recommended by a wide selection of experienced growers in Scotland and those receiving the highest number of positive ratings were awarded The Scottish Garden Plant Award. While nothing like an exhaustive list there are a number of bulbs in the Perennials, Alpines and Bulbs section but again you can see those most recommended as well as the hardiness rating for each one so you can fine tune your selection to your own particular weather. 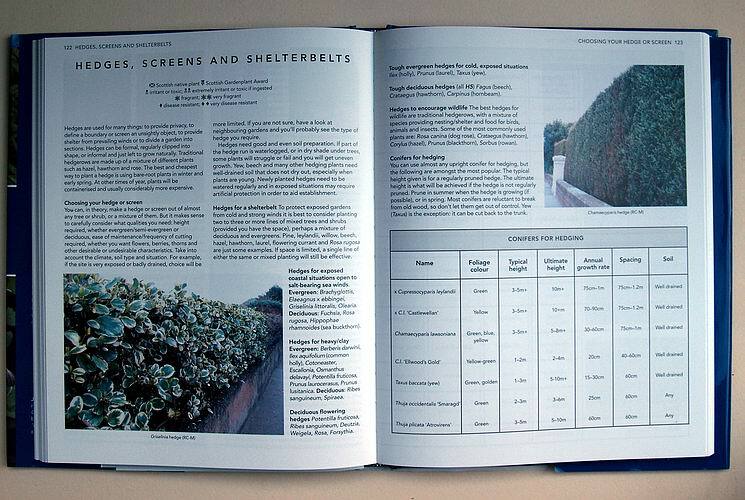 I also like a book that covers the basics of a garden such as hedges and shelter belts as well as the ornamentals and this book does it well- listing not only the most suited to your conditions but also ultimate heights etc. And that often asked question what plants are rabbit-resistant plants is addressed along with other planting suggestions if deer are your problem. 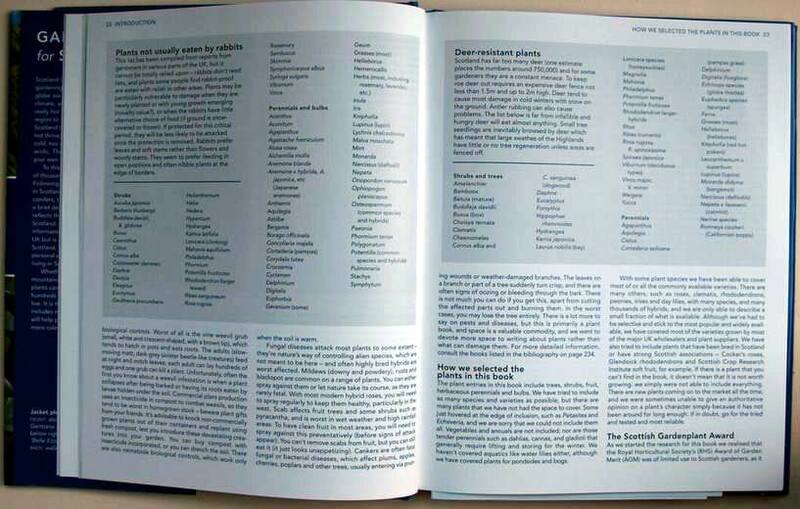 Also useful lists of plants tolerant of many of the common problems - salt, moist shade, wind, heavy clay are spread through the book. I find these lists so handy that I wrote the pages they appear on in pencil on the contents page so I could find them quickly. While not a specialist book I can highly recommend it for any gardener in Scotland or one in a similar climate and it would be an extremely useful book to give to any one just starting out on the gardening journey.